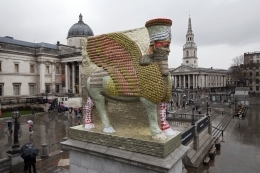 Installation view: Fourth Plinth commission, Trafalgar Square, London. March 28, 2018 - Present. The Invisible Enemy Should Not Exist, 2018, Iraqi date syrup cans, approx. 122 x 24 x 109 inches. 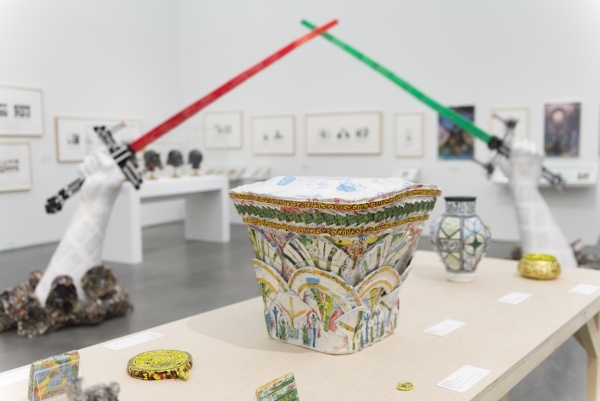 Installation view: Michael Rakowitz: Backstroke of the West, Museum of Contemporary Art Chicago. September 16 – March 4, 2018. May the Arrogant Not Prevail, 2010, Found Arabic packaging and newspapers, glue, cardboard, wood, 19 feet 7.25 inches x 16 feet 2.25 inches x 3 feet 1.5 inches. 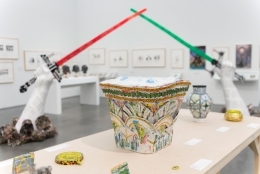 Installation view: Michael Rakowitz: Backstroke of the West, Museum of Contemporary Art Chicago. September 16 – March 4, 2018. May The Obdurate Foe Not Be In Good Health: White, limestone Corinthian capital with two rows of acanthi, leaves, Harem, Byzantine period (5th - 6th centuries AD), 2017, Middle eastern packaging and newspapers, glue, 61 x 14 centimeters. 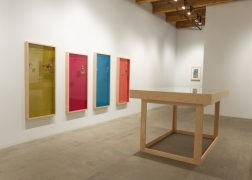 Installation view: Michael Rakowitz: Backstroke of the West, Museum of Contemporary Art Chicago. September 16 – March 4, 2018. 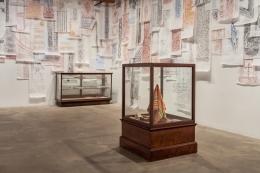 Installation view: Michael Rakowitz: The Flesh Is Yours, The Bones Are Ours, Rhona Hoffman Gallery, May 19 – August 13, 2016. Architect as Dragoman (The Flesh Is Yours, the Bones Are Ours), 2015, Mixed media, 52 x 31.5 x 31.5 inches. Installation view: Michael Rakowitz: The Flesh Is Yours, The Bones Are Ours, Rhona Hoffman Gallery, May 19 – August 13, 2016. 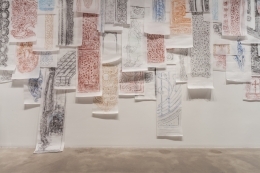 Installation view: Michael Rakowitz: Dar Al Sulh, Dubai. May 1-7, 2013. Installation view: The Breakup, Rhona Hoffman Gallery, January 11 - February 22, 2014. John (Egypt), Ringo (Jordan), Paul (Palestine), George (Iraq), 2012, Vintage satin, medals, lacquer pen writing, George: 53.625 x 23.625 inches, framed. 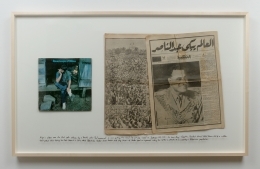 John (Egypt), Ringo (Jordan), Paul (Palestine), George (Iraq), 2012, Vintage satin, medals, lacquer pen writing, John: 53.75 x 23.625 inches, framed. John (Egypt), Ringo (Jordan), Paul (Palestine), George (Iraq), 2012, Vintage satin, medals, lacquer pen writing, Paul: 54.5 x 23.625 inches, framed. John (Egypt), Ringo (Jordan), Paul (Palestine), George (Iraq), 2012, Vintage satin, medals, lacquer pen writing, Ringo: 50.75 x 23.625 inches, framed. 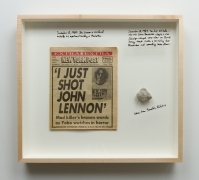 Study for The Breakup - Fantasy Objects, 2010-2012, Get Back fantasy album and ephemera, 1970; Joe Orton, Up Against It, book; Live in Saratha fantasy album, 1969; Beatles signature in the hand of Paul McCartney, 1965; Yoko Ono, Now or Never LP, 1972; Yesterday and Today LP, butcher cover, 1966; Muammar Gaddafi stamp, 1986; fantasy concert ticket, 1965; Israeli currency for the Occupied Territories, never printed in Israel, 1967; Coins, never issued in California, 2010; Currency from Jordan, Syria and Egypt, 1967, 48 x 72 inches (vitrine top dimensions), Vitrine 3 of 4. 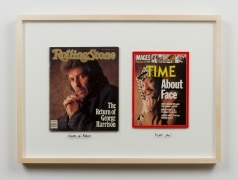 Abtal al Awda/Heroes of Revolution, 2014, Rolling Stone magazine from October 22, 1987 with George Harrison on the cover paired with Time Magazine from December 26, 1988 with Yasser Arafat on the cover, 21.125 x 29.125 x 2 inches. Beaucoups of Blues, 2014, Album cover of Ringo Starr's "Beaucoups of Blues" 1970 album paired with September 30, 1970 Al Gomhouria newspaper from Egypt, 33.5 x 54.75 x 2 inches. December 8, 2014, New York Post newspaper, December 9, 1980; stone from Ramallah, West Bank 1987 intifada, 25.25 x 28.25 x 3 inches. 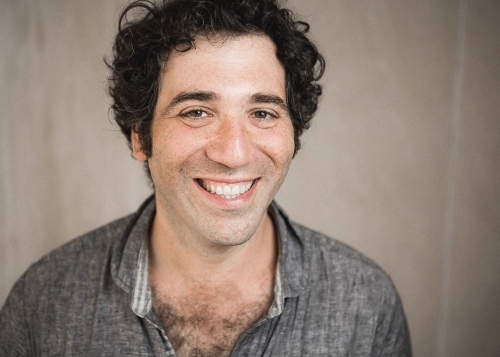 MICHAEL RAKOWITZ (b. 1973, New York) is an artist living and working in Chicago. In 1998 he initiated paraSITE, an ongoing project in which the artist custom builds inflatable shelters for homeless people that attach to the exterior outtake vents of a building’s heating, ventilation, or air conditioning system. His work has appeared in venues worldwide including DOCUMENTA (13), P.S.1, MoMA, MassMOCA, Castello di Rivoli, the 16th Biennale of Sydney, the 10th and 14th Istanbul Biennials, Sharjah Biennial 8, Tirana Biennale, National Design Triennial at the Cooper-Hewitt, and Transmediale 05. 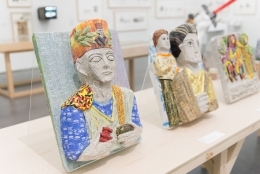 He has had solo exhibitions at Tate Modern in London, Lombard Freid Gallery in New York, Alberto Peola Arte Contemporanea in Torino, and Kunstraum Innsbruck. His public project, Return, was presented by Creative Time in New York in 2006. He is the recipient of a 2012 Tiffany Foundation Award; a 2008 Creative Capital Grant; a Sharjah Biennial Jury Award; a 2006 New York Foundation for the Arts Fellowship Grant in Architecture and Environmental Structures; the 2003 Dena Foundation Award, and the 2002 Design 21 Grand Prix from UNESCO. His work features in major private and public collections including the Museum of Modern Art, New York; Neue Galerie, Kassel, Germany; Museum of Contemporary Art, Chicago; Smart Museum of Art, Chicago; Van Abbemuseum, Endhoven, Netherlands; The British Museum; The Metropolitan Museum of Art, New York; Kabul National Museum, Afghanistan; and UNESCO, Paris. His solo exhibition, The worst condition is to pass under a sword which is not one’s own was on view at Tate Modern in London in 2010. 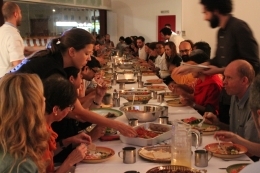 Rakowitz was commissioned by Creative Time in 2011 for his project, Spoils, a culinary intervention at New York City’s Park Avenue restaurant that invited diners to eat off of plates looted from Saddam Hussein’s palaces. The project culminated in the repatriation of the former Iraqi President’s flatware to the Republic of Iraq at the behest of current Prime Minister Nuri Al Maliki on December 15, 2011—the date Coalition Forces left Iraq. 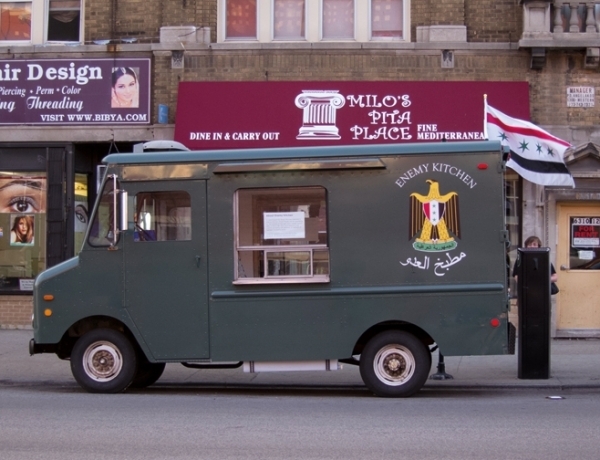 Enemy Kitchen (2003-ongoing) is a food truck serving Iraqi food to Chicago’s hungry public, staffed by veterans of the Iraq War working under Iraqi refugee chefs. 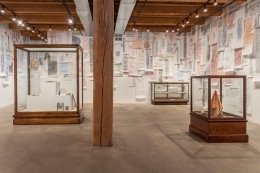 His first US museum survey, Backstroke of the West, opened at the Museum of Contemporary Art Chicago in September 2017. 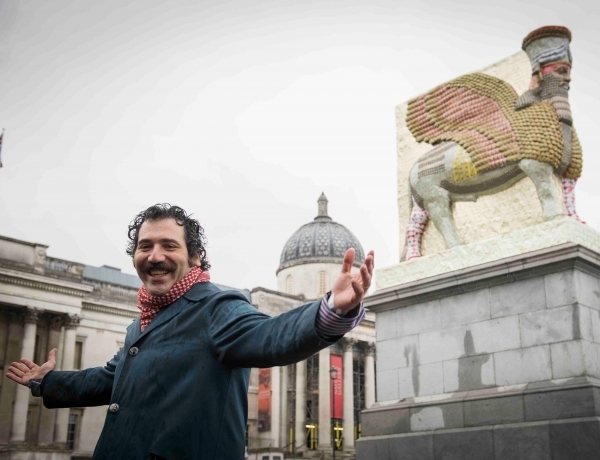 He has also been awarded the Fourth Plinth commission in London’s Trafalgar Square which will be unveiled in 2018. 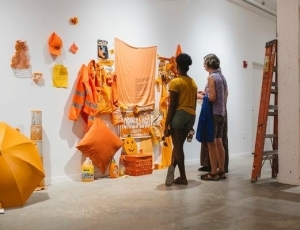 Rakowitz is Professor of Art Theory and Practice at Northwestern University.